Pressing ESC shows an index of all slides from where you can target each slide individually. If you’d like to enable mouse navigation in addition to keyboard control, you can do so by implementing a small operating element into your presentation. To achieve mouse navigation you integrate a small snippet of code into the container right after the slides definition. You’ll see a control element showing the four directions symbolized by their respective arrow keys at the bottom right of the browser window. In long presentations you might like to have a progress bar shown, just to make sure you don’t get lost or bend your speaking time too much. Again this is just one line of code. The progress bar shows up at the bottom horizontal. Its position represents the position of the active slide in the whole presentation. This one is for me. Instead of using HTML to style the contents of your slides, you can as well make use of the simple Markdown syntax. I use that all of the time. This article is written in Markdown. 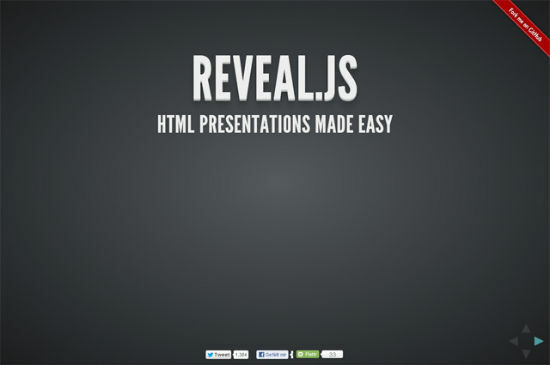 Reveal.js will simply translate your Markdown to HTML. Advantage: A content in Markdown is lots easier to maintain as you don’t have to search for the content inside of all those opening and closing tags. Any way to get this working locally on an iPad without a connection running a local copy? Thats where PPT or Keynote are a must have. I’m afraid that the reason for people yawning when someone says PowerPoint is not PowerPoint but all the companies and presenters that use this program in the wrong way. And that is something that you can not solve by changing the program. This doesn’t mean that Reveal.Js is a bad alternative to PPT but you need to first teach the presenters how to prepare a good presentation (regardless the software used). Wow. This is really slick. I am also very impressed with the rvl.io online editor. Looks beautiful on my Gen 1 iPad. Thanks for posting! Your Markdown example is completely wrong & will not work. Dang it – it didn’t go through. Let’s try again. Substitute [right-angle-bracket] & [left-angle-bracket] for the correct symbols on your keyboard. Hey, could I use this inside GitHub read me files? That would be totally sweet. Nice tutorial, but I agree with Roger, this should be next to a “how to design a good presentation” post. Anyway, this is a very interesting and easy way to develop your next presentation. I don’t quite understand how the Reveal.js could work the way it is explained. Also, I feel only a small majority of people could understand how to use this, where PowerPoint is user friendly and easier for just anyone to use. Prezi, an online presentation software, has the best of both PowerPoint and Reveal.js, as far as I can see. It’s both user friendly and can be accessed with an Intenet connection. I just don’t see the value in this except for the few people who know how to use html to design. And you know what the major problem is? No browser out there except Chrome does CSS3D transforms. Firefox does them very very poorly. Chrome does CSS3D very well, but has no FullScreen API exposed on Android that can put the presentation full screen. Bummer all the way. I think nobody needs a better mousetrap. PPT is great for presentations. Where all these “sliders” excel is as image galleries! Write it up as an image gallery and intersperse slides containing comments. Works great! I happen to think reveal.js is best of the lot. 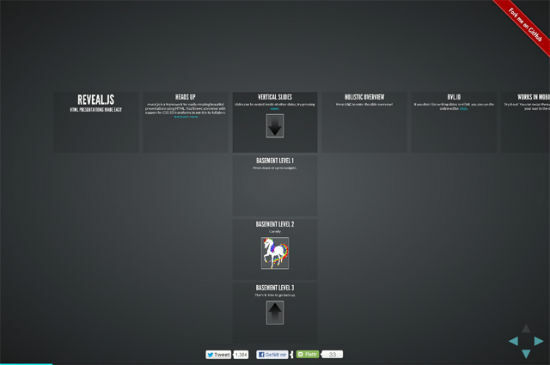 I tried several tuts of impress.js with The latest Chrome and Win7 Ultimate. Couldn’t ge them to work. they just showed all slides at once. Another reason for sliders to limit them selves to image galleries is this: I bet that marketing supervisor is one heck of a salesman. Can he progream? Probably not. He’s going to want to use Powerpoint or a web-based alternative.